Jasmine Villa is in the perfect position. 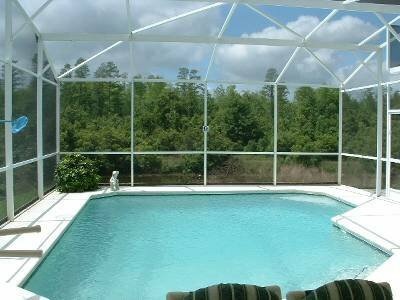 You are guaranteed the maximum sunshine available here in sunny Florida,with the back of the villa facing South and West .The pool and deck area capture every ounce of sun and with a view over a lake alive with Gators, Otters, Turtles and all kind of Birdlife what more could you want ? You get more..... spectacular sunsets over the Preserve. But there’s also enough shade if you want to cool down a little. The pool area is totally private, no rear neighbours ! The Hot Tub also overlooks the beautiful views and what could be better after a busy and tiring day than a luxurious and relaxing bubbly soak while watching one of the gorgeous Florida sunsets ! Plenty of sun loungers and a large 6 seater dining table and chairs for those breakfasts, lunches and dinners in the great outdoors. The Master suite has direct access to the deck and pool, overhead fan and 50"TV and the Master Ensuite has a walk in shower ,a seperate bathtub, toilet and his and hers vanity units. The 2nd Bedroom has views over the lake and Preserve and is one step from its own bathroomwhich has a walk-in shower,toilet,vanity unit and direct access to the pool. Our twin rooms are themed .A “Princess Room” and a “Mickey Room” to entertain the youngsters, not to mention the “Winnie the Pooh” bathroom. A mini crib is available for children under 2 years of age. Having 2 sitting areas , the Family Room and the Sitting room, the house has enough room for everyone to be able to lounge in comfort. The Family room has a large wrap-a-round sofa and seperate armchair. There are triple sliders out onto the pool and deck area. The Sitting room has a large sectional sofa. There are double sliders to the pool and deck area. The 2 dining areas and bar stools allow everyone to have breakfast at the same time and the open plan kitchen means that nobody has to be “Cinderella” shut away in another room. The formal Dining table seats 6 , the Cafe area seats 4 and there are 2 bar stools. Our games room provides pool, table tennis and an air hockey table . The Home Theater system with a 55" High Definition TV and cable service provides an entertaining night in. For those more athletic types there are 2 bikes, 4 rackets and a stock of tennis balls to use at the community area, available exclusively for Residents and Guests of Westridge. Not forgetting the Tot Lot for the kiddies. Jasmine villa is in a fantastic position. Located off the US27 it has access within minutes to Interstate 4 and the 192 in the opposite direction. Yet the villa is situated right at the back of Westridge......so, no noise ! and no traffic ! There are local supermarkets, Publix and Walmart, Restaurants, Applebees, I Hop, Beef O Bradys, Cracker Barrell etc and the shopping mall at Posner Park which has Target, Best Buy, Ross, Michaels, J,C Penny and many more. A cinema with I Max. Disney Parks are 11 miles away. Universal Parks are 30 mins drive and Seaworld and the New Aquatica water park are 20 mins away. Plenty of Golf courses including, Champions Gate, Highlands Reserve and Ridgewood Lakes are within 10 mins. Pool and deck South/West facing. Hot Tub with spectacular views over the pond and Preserve.